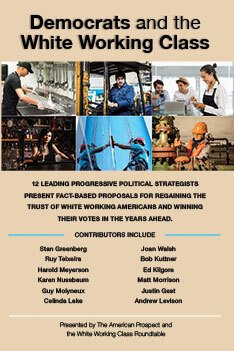 The white working class roundtable was formed in 2013 for the purpose of bringing together progressive political strategists and activists who believe in the urgent need for progressives and Democrats to regain lost support among white working class Americans. The 2017 white working Class Roundtable brought together 12 leading progressive thinkers to discuss strategies for responding to the new situation created by the election of Donald Trump. These essays were published in the book “Democrats and the White Working Class,” which was published in the Spring of 2017 and which can be ordered from Amazon and other online booksellers. On June 23, 2017 a roundtable discussion including principal roundtable organizers Stan Greenberg, Ruy Teixeira, Karen Nussbaum, Harold Meyerson, Matt Morrison and moderated by E.J. Dionne was held at the national press club. You can read the major addresses HERE. Looking ahead, the White Working Class Roundtable will be convening further meetings and discussions and issuing a periodic bulletin. You can sign up for updates on the Roundtable’s work HERE.